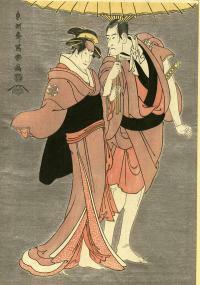 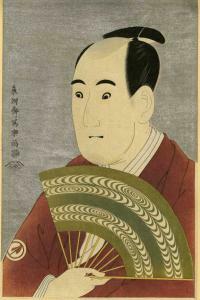 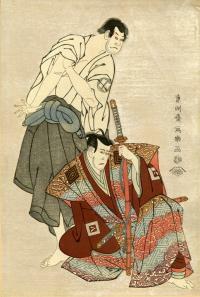 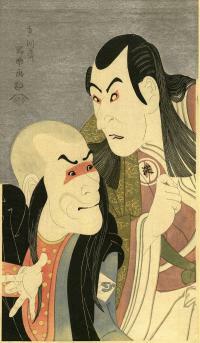 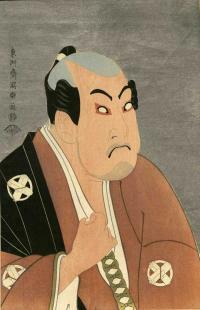 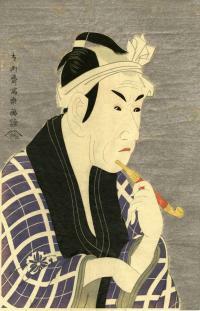 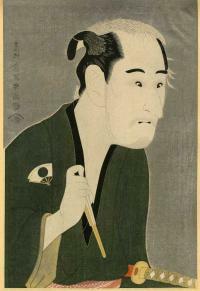 Sharaku (1784-1785) Reproductions An extremely rare series of prints published in 1940 by Adachi. 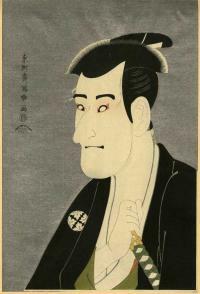 Adachi succeeded in reproducing these famous prints of the 18th century master, Sharaku, with such brilliance that they rival the original prints. 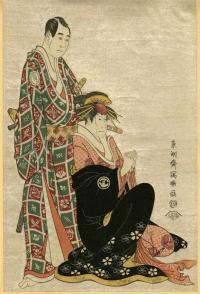 Because these prints were so difficult to make and so expensive to produce, they were limited to an edition of 300. 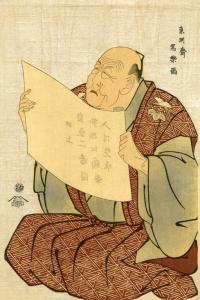 Mica was lavished on the prints, the finest pigments were used, the paper is exquisite and hand-made, and the craftsmen were the finest. 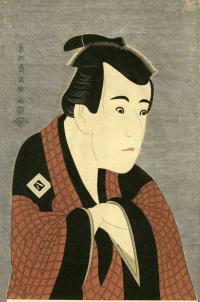 Size: 8 7/8" x 15 1/4"
Misc: Sharaku appeared on the Ukiyo-e printmaking scene in 1784 and took it by storm becoming an instant success. 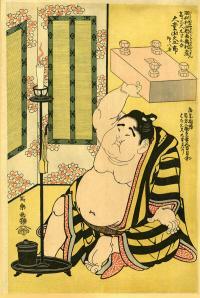 He worked for only 10 months then mysteriously disappeared. 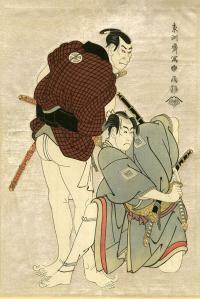 Size: 9 3/4" x 15 1/8"
Size: 10 1/8" x 15 1/8"
Size: 10 1/4" x 15 1/4"
Misc: Sukeroku, disguized as punk looks for his ancestor's precious sword, by picking a fight to have opponent draw his sword. 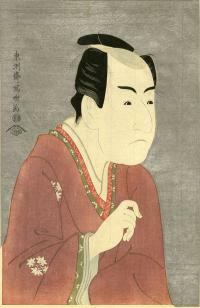 Sharaku appeared on the Ukiyo-e printmaking scene in 1784 and took it by storm becoming an instant success. 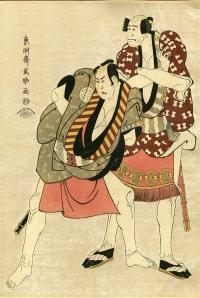 He worked for only 10 months then mysteriously disappeared. 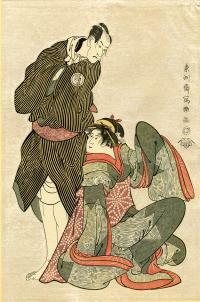 Size: 10 " x 15 1/4"
Size: 9 7/8" x 15"
Size: 10 3/8" x 15 1/2"
Size: 10 1/8" x 15 3/8"
Size: 10 5/16" x 15 1/4"
Size: 10 1/4" x 15"
Size: 10 1/4" x 15 1/2"
Size: 10" x 15 1/8"
Size: 10 1/4" x 15 3/8"
Size: 9 7/8" x 15 1/8"
Misc: The top knot hair style is used by samurai & merchants. 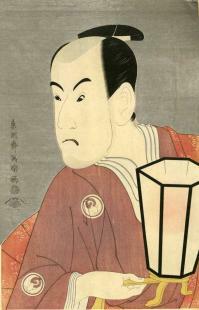 This is merchant as seen by his lamp. 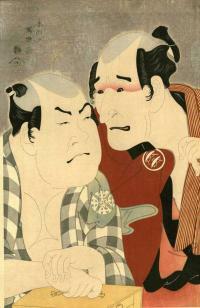 Sharaku appeared on the Ukiyo-e printmaking scene in 1784 and took it by storm becoming an instant success. 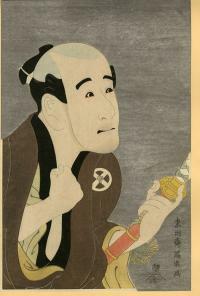 He worked for only 10 months then mysteriously disappeared.